For the past several weeks the kids and I been watching life form before our eyes. Life of baby Blue Birds that is. The kids and I absolutely love our new home; one of the great things we love about it, the front porch that is covered. Apparently the Blue Birds like it too. There were two nests one of each side of the porch. Unfortunately the first batch of birds did not make it because another bird attacked the nest and all the eggs landed on our concrete patio. Then we realized there was another batch of eggs in the other nest. So we have been witnessing the miracle of the little guys growing. It’s truly an amazing sight to see. There were originally four, one was dead on the patio. This whole life thing is tough business. My daughter got upset seeing the dead baby bird and we had a lesson on how nature works. As we as adults know if there is something wrong with the babies mother bird will toss it out of the nest. Or it could have been four was a little too crowded, one rolled over and one fell out. Regardless it was sad. We’re sappy like that. Looking at nature is wonderful. My mother and I did it all the time and I learned even though it’s pretty you don’t touch animals when they are born. I learned this lesson with kittens that were born in the barn. As cute as they were if humans touch them mama may not anymore. Over the past few weeks I have taken pictures without disrupting the nest. I wanted to share with all of you photos of these little guys over the past few weeks. 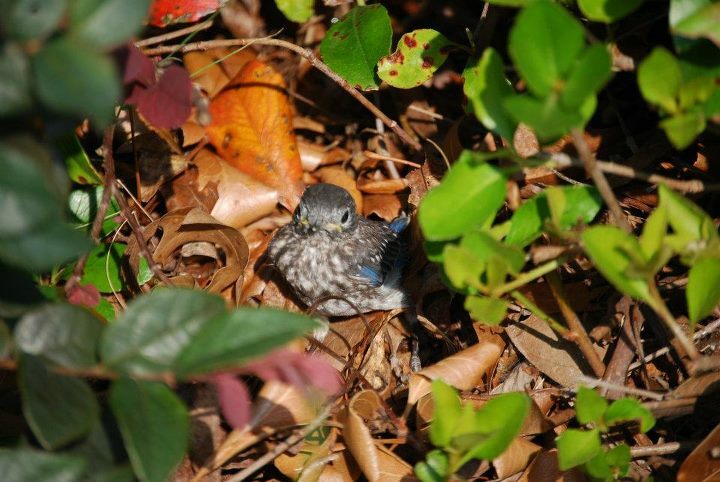 Last week one of the birds (I called him Fred) fell out of the nest. Carefully without putting our human scent on him we put him back into the nest. 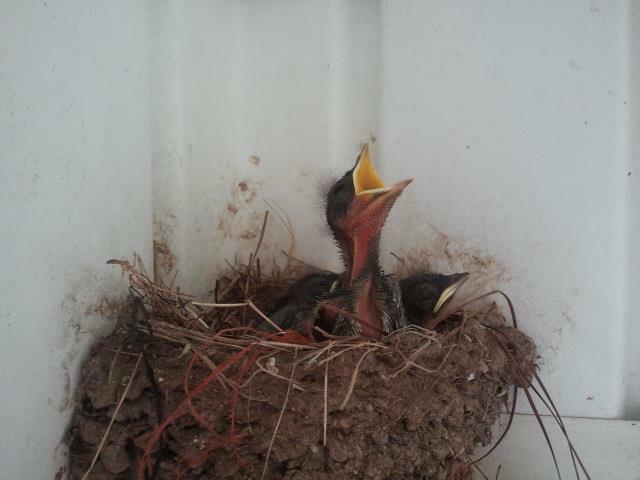 This morning those 3 baby birds took their first flight out of the nest. I was sitting out on my front porch when they decided it was time. Mama bird was not around. 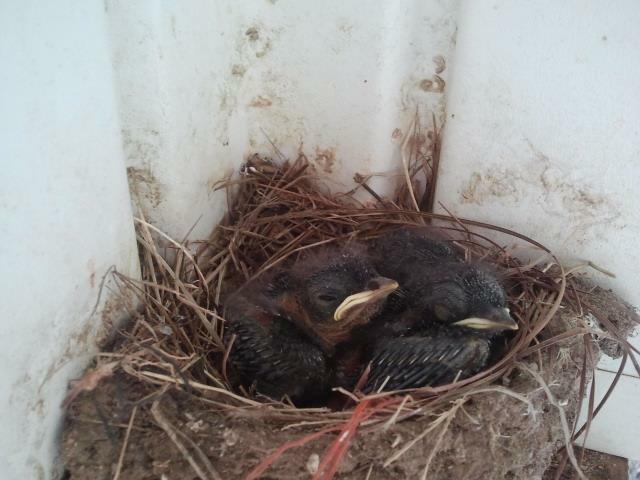 Infact, when they all were out of the nest she came into feed them; to find them gone. I had all ready witnessed the great escape. I had never seen how this happened before. Truly it’s an amazing thing to witness. It started while I was out having coffee. I heard something hit the house and then I saw it was a baby bird. He made quite a journey all ready, because he hit the opposite side of the house by the porch. 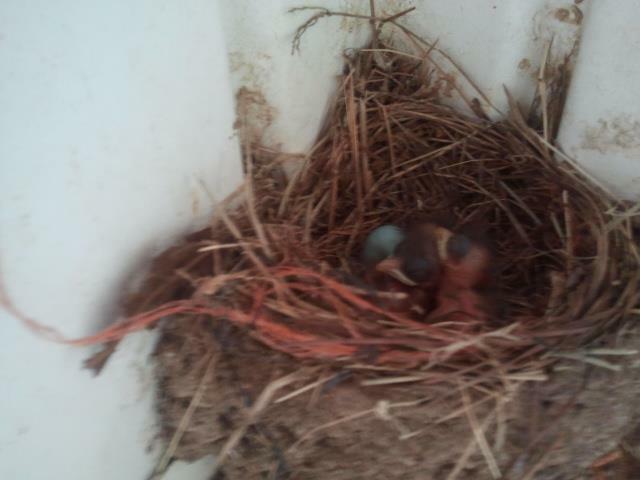 I looked up and saw two birds in the nest peeking out, flapping their wings. The next one was working up the courage to take that first flight. He just jumped and hit the wall about 3 ft from the house. Then the last one took a little time but finally jumped; this little guy didn’t get very far…straight down on the concrete slab. For the next few hours I watched carefully. I wanted to get pictures, but I also didn’t want to disrupt the process. It reminded me of when both my children took their first steps. The neighbors probably thought I was a fool talking to the bushes and encouraging them. Each of the birds ended up in the bushes that are next to the nest. One by one, on their own time each of them came out of the exact same spot. I couldn’t believe it, all the nooks and crannies ad all 3 of them came out the same way. They flew….they fell; they crashed they hopped, the entire length of the house to the back yard where we have a beautiful setting for birds. If I lost track of the birds I looked up to see where mom and dad were. They had a perimeter set up that they guarded. The baby birds had to figure this out on their own, mom and dad weren’t near them, but were ready to protect them if need be. Again it brought me back to moments as a mom. It also reminded me of my very first day of school. Mom hid behind the pine tree at the end of the lane way. I wanted her to. Years later she told me she stood behind the tree bawling her eyes out. I had several moments like this with my own children. 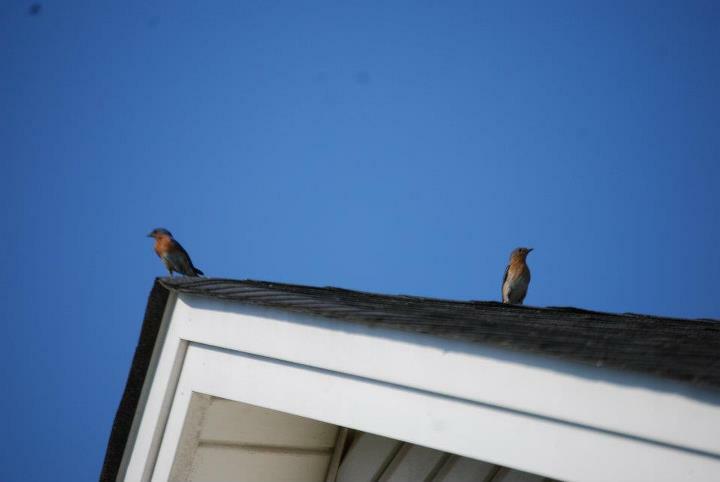 I found myself wondering how the mom and dad blue birds were holding up. 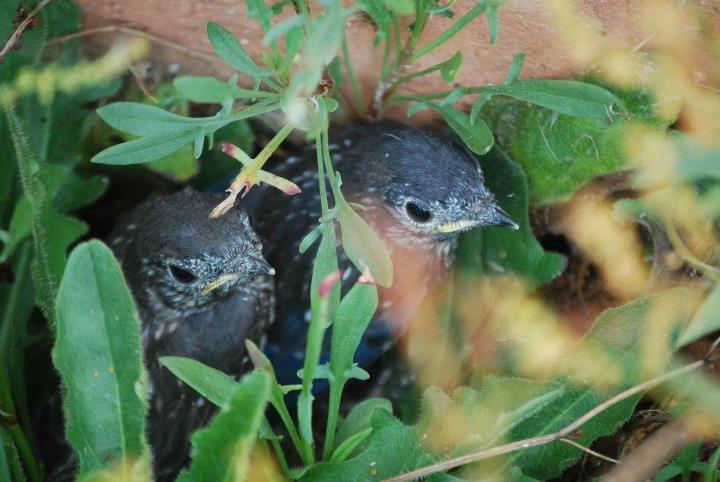 I was a nervous wreck and they weren’t even my baby birds. For those baby birds it will probably be maybe a couple more weeks; maybe even days then they will be on their own. The first flight for a bird happens just once and then they are off into the world. For us as human parents, there are several first flights or as we call them milestone, that we witness with our children. 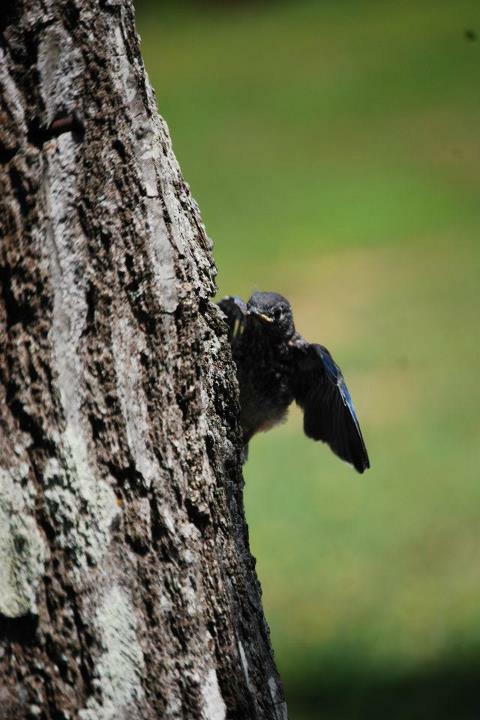 Whether it is watching your own children take their first flight or watching baby blue birds take their first flight it’s an amazing process to watch. I’ve had to get used to many things since living in the south since 2001. For one school for my kids does not go from September to June. Yesterday, May 22, 2012 was my children’s last day of school. My handsome young man will be going into high school next year; my lil miss will be going into the 3rd grade. Yes, you get brownie points if you tell me at 34 years old I do not look old enough to have a son going into high school. I remind my children…“I remember what it was like being a kid.” I guess I am a parent when they look at me like I have lost my marbles….just like I did when my mother said those exact same words. Of course my mom was born n 1943 and had been just before she turned 36. Lol when I had my son (almost 15 years ago) I had only been out of high school since June 1996. The 1960’s and the 1990’s were a smidge bit different. Regardless kids love summer time. Hell adults love summer time. Despite the money situation, despite all the issues going on between the divorce and their dad; they will have a good summer. Sometimes the greatest memories don’t require the best vacations that you didn’t know your parents couldn’t exactly afford. My fondest memories of summer–hanging out with my two best friends. Ok Ok you got me I am snickering a little bit. There was baseball in my best friends yard. I don’t even think my friends and I played baseball we just had her brother hit the balls, to see how far he could get them into “the Triangle.” The triangle you ask? Oh you only get a triangle if you live where we lived. Essentially it was the little part the construction people forgot about when making a road. Yes where I come from we were guilty of landmark directions. When you said “meet you at the triangle” you knew it was the intersection..out in Chamcook. We were quite pissed years later when they paved our paradise and we couldn’t play there any more. God only remembers what we played in the triangle. Of course as you get older your summers get more cool; or so we thought; because we were cool. There were Glass Tiger concers; Lee Aaron concerts. Hey don’t mock me. Lee Aaron was Canada’s queen of Heavy Metal. Summers for me are memories of sleep overs; that sleeping never took place. Going for a little toodle (a drive) that sometimes ended up being 2 hours and God knows where we would end up. The sun stayed out until around 9 close to 10 pm if I recall (Atlantic time). Playing some sort of card game with my best friends family, going on another genealogy adventure with mom. Summer meant awesome take out. By take out I mean…you sit in your car and eat your food. The windows get fogged up. Many of the “take-outs” back home are seasonal and it’s not full on like donkey kong until the American Memorial Day Weekend. Fries and fried scallops, tuna rolls, lobster rolls. Seafood platters. Summer’s were going to the lake, summers were freaking awesome as a kid and we didn’t need to be going to some awesome vacation. We had vacation in our own back yard. The ocean, lakes, nature trails and all the fun things to do back home. Just being and hanging out was awesome. You will notice I am changing sites and changing things around. I will let you all know if more changes are coming. There are a lot of things I love doing. Writing is just one of them. However, I am a jack of all trades. There is nothing I can’t do. I love computers and I love the design aspect as well. The blog will start slow and hopefully as more people discover this site there will be more advancing. Please keep up with my facebook page as well on One Woman.